Belegarth • View topic - So you want to sell your crafts? So you want to sell your crafts? Post subject: So you want to sell your crafts? New sticky because we see people advertising their crafts regularly. First off, you're welcome to post anything that you think a member of this community might be interested in, even if it's not specifically related to Belegarth. That said, if you're crafting goods (armor, weapons, garb, accessories (jewellery, feast gear, etc), or anything else for use in Belegarth), read through these steps first. They're not absolutely concrete and required, but making sure your work meets this criteria will increase your chances of sale. Description: Duh. Don't **** this up. Price: Is it negotiable? Does it include shipping? If not, how much do you think shipping will be? Payment method: Do you have PayPal account or will you only accept cash in person? Are you going to ship it or are you willing to deliver to an event? If you're willing to deliver in person at an event, say what events you're planning on attending. Picture: Unless you're very well known, no one is going to buy anything without seeing it first. Take good pictures - be sure they're not blurry and have decent lighting. This will go a long way towards making your product look as good online as it does in real life. 2) What kind of materials and construction methods are you using in your product? This overlaps with the description above, but is important enough (especially regarding weapons) that it warrants its own point. If you're offering weapons, potential buyers are going to want to know what materials are going into the items you're offering and how you make them. 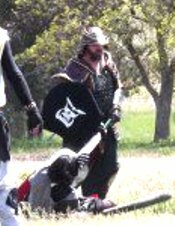 If you're making broadswords and maces out of PVC, blue foam, DAP, duct tape and broadcloth, say so. There's no shame in making weapons like this, but be aware that most folks who are interested in purchasing weapons are doing so because they want to purchase higher quality weapons then they can craft themselves or are looking to purchase high quality weapons because they no longer have the time to construct them personally. It's very important to note here that you shouldn't try to overvalue your product - if you have been fighting and building weapons for six months and have your swords down to a science, more power to you, but please be aware that this is often not the case. 3) Do you have any testimonials? If you're a first time seller (and especially if you're new to the boards and/or Belegarth), people are going to be a little bit leery of purchasing your items. You can counteract this by providing feedback from satisfied customers as well as making sure you follow all the other points here. 4) Why should someone buy your product? Here is where you should note that you've been the realm foamsmith for the last four years and have been making and repairing all of your group's loaner weapons. Here is where you should tell how your garb won a 'Best Garb' contest. There are almost assuredly a number of places someone can buy a similar item. What makes yours the best? Do you have a website that has more information? Absolutely post that link. Have you made a post in another subforum describing how you make your items? Of course you should post that link. Buyers will be much more confident in purchasing an item if they're able to see the construction process. And finally, if you're looking to sell something locally, you would do well to first attempt posting in your local forum and/or letting people know in person. It might be that a good number of people don't check the national forums or might skip over your post. It's almost always much easier to sell in person where physical examination is possible. Post subject: Re: So you want to sell your crafts? Let me know if there's anything that should be added. Hopefully this can increase the quality of the vendor posts we have here. Website links and other contact information are also a good thing to post. Derian, it's so cute when you lie to them. Blue foam and PVC? Yes, shame indeed, feel it. I have some goods to peddle but I can't handle criticism because of my shady background (I have a big white van w/ FREE CANDY painted down the side), so is it possible that I can abuse some moderator privileges and lock my thread when other posters can't? It sounds like a nice way to one up the competition. Also, if you guys would be dolls and only unlock it so I can bump it every now and then that would just be peaches and gravy. I mean, it's not like it's really abusing power here, because I'm not asking you sticky it. I'm just asking you to keep it on top w/o having to hold myself accountable for any of my terrible wares or despicable past deeds. Boris took me for a ride at CW14.